I totally thought I could sneak in one last soup recipe before the weather started heating up, but I failed miserably! We had a cold spell here in Utah during May with rain almost every day and temperatures never exceeding the low 70’s, which was awesome! But all of the sudden summer is here and it got to 85 this past weekend! 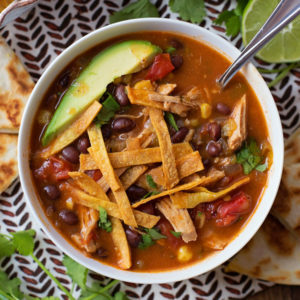 So while my timing for this recipe is a little off, it’s still crazy delicious and perfect for just about any time of the year, hot or cold! I think I’ve mentioned my love for soup here on the blog about 1000x. 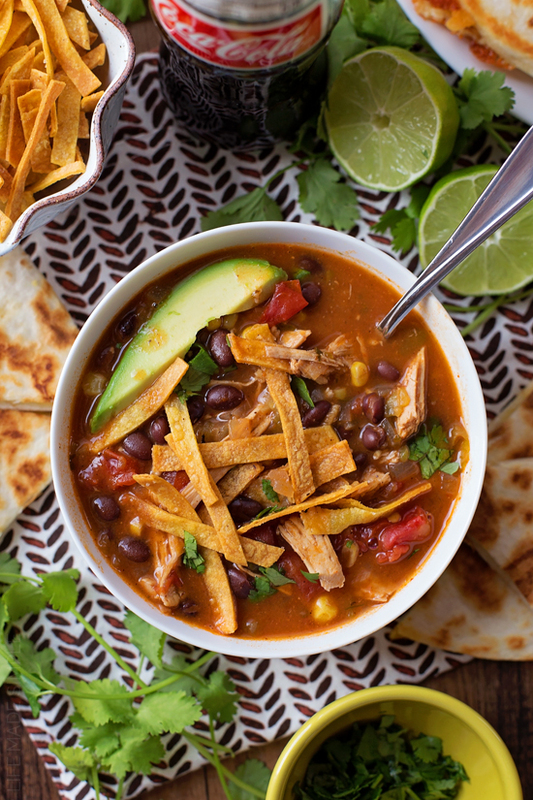 This chicken enchilada soup though, it’s a saucier, spicier version of tortilla soup… and it’s gooood, really goood! I love how easy it is to prep and how quickly it comes together. I cooked a few chicken breasts on the side to add in at the end (it’s what I had in my freezer), but rotisserie chicken works great too- anything to simplify dinner these days. The rest is just a little chopping here and there, opening some cans and letting the stovetop do the rest. Pregnant me wishes dinner could be this easy every night… wait, it was, for like 2 nights in a row 🙂 Hello leftovers! We served up ours with some grilled quesadillas and fresh fruit. It was simple & downright delicious. I’d highly recommend garnishing each bowl with crispy tortilla strips, chopped avocado, cilantro and a few squeezes of lime. It’ll definitely hit the spot! 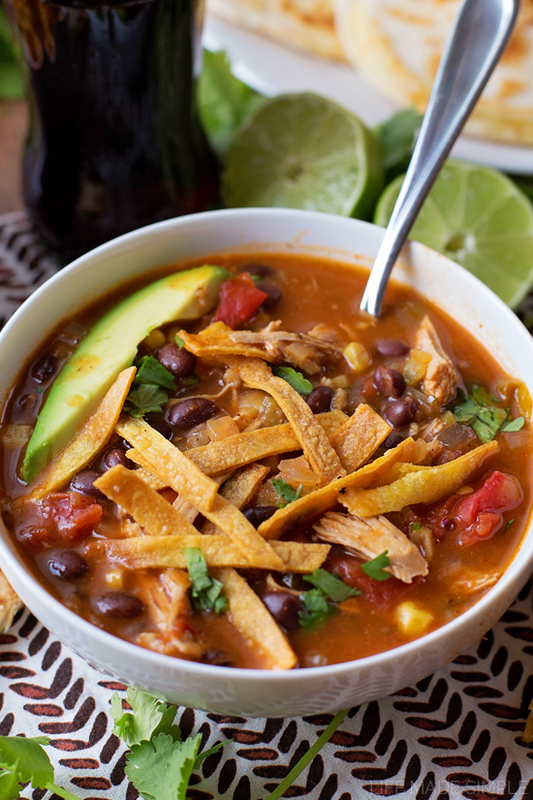 Whether it’s summer, fall, winter or spring, this soup makes a perfect weeknight meal! 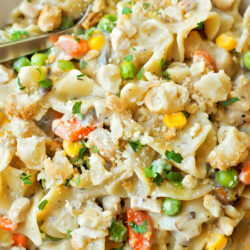 It’s flavorful, filling and almost effortless… everything I love when it comes to dinner! Enjoy! 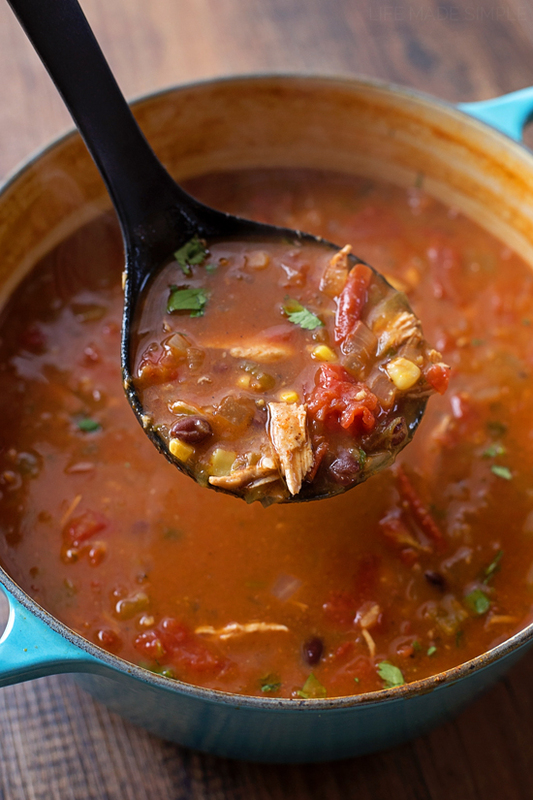 Nothing beats this flavorful and filling chicken enchilada soup! It's packed with protein and veggies and garnished with tortilla strips, avocado, cilantro and a squeeze of lime. Mmmm! For the chicken: preheat oven to 375 degrees. Drizzle 1 tbsp. of olive oil on the chicken breasts, then mix the chili powder, garlic powder, cumin and salt together and sprinkle on both sides. Place on a parchment-lined baking sheet and bake for about 25 minutes or until the chicken reaches an internal temperature of 160 degrees (it will rise to 165 as it rests). Allow to cool for 3-4 minutes then shred. For the soup: meanwhile, in a large stockpot or Dutch-oven set over medium-low heat, add the remaining olive oil. When the oil is hot, add the onions and cook until soft, then add the garlic and cook until fragrant (taking care not to brown). 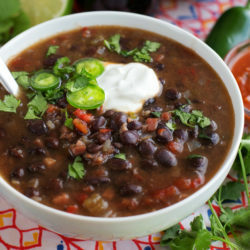 Turn the heat up to medium and add the corn, black beans, diced tomatoes, and green chilies. Cook for 3-4 minutes then pour in the seasonings along with the lime juice, chicken stock and enchilada sauce. Bring to a boil, then reduce heat and simmer for about 30-45 minutes. During the last 5 minutes add in the chicken, cilantro and heavy cream. 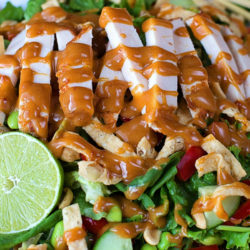 Garnish individual bowls with tortilla strips, shredded cheese, cilantro, avocado chunks and lime wedges. **You can easily swap out the heavy cream for equal parts sour cream or plain Greek yogurt. The cream is what I had on hand, but the others will work too! I LOVE this recipe! I have made it twice now and my family and friends just love it. My son enjoyed it most of all. Big win and an awesome thumbs up!